A group of people, during the just-ended Easter festivities, presented the children of Remar Orphanage in Ho, the Volta Regional capital, with a pair each of Horseman shoes – aka the President’s shoes as according to President Mahama, he wears that brand of shoes. The other items donated included, bags of rice, maize, beans, several tubers of yam, cooking oil, detergents, carton of tomato paste and chickens. The children, who numbered about 26, were highly excited when they realized that they were among the privileged few to wear shoes manufactured by the same person that the President buys his from. Many of them unconsciously shouted in concert thus, “I will become a President,” as they jumped about. This gesture was initiated by Frederick Duodu Takyi, the Volta Regional Manager of Western Publications (Publishers of DAILY GUIDE). Presenting the items at the Orphanage on Easter weekend, Mr. Takyi expressed gratitude to all who assisted, including Tonyi Senaya, CEO of Horseman Shoes; Evans Nartey and Awura Abena Agyeman of Wear Ghana, who supplied school bags to the children; Ivy Duku Plange of SBIG and Edidson Chouest, Offshore Ghana Limited, for giving T-Shirts and pairs of shorts. As part of the gesture, the Volta Regional Office of Zoomlion Ghana Limited also fumigated the entire Orphanage to protect the children against infections and diseases. Abbena Ofosua Abboah-Offei and her colleagues at the University of Ghana, Legon, also donated lots of clothes, accessories and footwears. 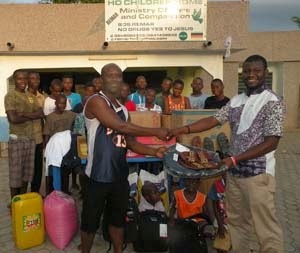 The donation was coordinated by Godfred Nelson, Benjamin Aklaku, George Asamoah, Amenuveve Agboklu and Lambert Atsivor. Prior to the donation, the group also facilitated radio discussions on Ho-based US FM to create awareness on the children’s home, which had been in the region for three years, but lacked adequate publicity. Mr. Olivier Kedasam, caretaker of the Orphanage, also expressed gratitude to the benefactors. He added that “the shoes, the bags and the dresses have solved most of our problems” but appealed for more support, especially in the area of school fees which he admitted was a great challenge. He was hopeful that by the time school re-opened some benefactors would have come to their aid. Meanwhile, members of the Rotract Club of Osu RE and their Nigerian counterparts also made separate donations to the orphanage.